Cultural Connections‘ show hosts Candace and Michael Penney interview Agnes “Grandma Aggie” Baker Pilgrim, Chairwoman of the International Council of Thirteen Indigenous Grandmothers. 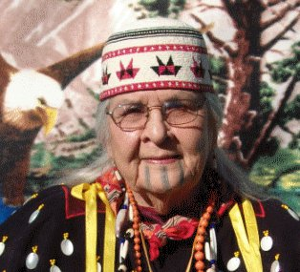 Grandma Aggie is a Native American Spiritual Elder from Grants Pass, Oregon. As the oldest member of her tribe, the Takelma, Grandma Aggie has been honored as a “Living Treasure” by the Confederated Tribe of Siletz and as a “Living Cultural Legend” by the Oregon Council on the Arts. Grandma Aggie is Candace’s Aunt. Grandmother Aggie’s message is a rare gift to be shared both here on the Wild Rivers Coast and with the world community. Friends of KCIW are invited to a very special event on Saturday, June 18th at 1:00 – 5:00 PM at the Howonquet Hall in Smith River where Grandma Aggie will speak about her experiences, share her wisdom, and discuss the documentary film, For the Next Seven Generations: The Grandmothers Speak. You can visit Agnes Baker Pilgrim’s Facecbook page and let her know that you appreciate her wisdom and this program! At 92 years of age, her gift of storytelling and sharing are still a true passion. The Grandmothers came together from across the globe to create a council of women to bring a message to the rest of us. Their special voices have brought awareness to their deep concerns over the unprecedented destruction of our Mother Earth, the atrocities of war, the global scourge of poverty, the prevailing culture of materialism, the epidemics that threaten the health of Earth’s peoples, and the destruction of indigenous people’s ways of life. The International Council of Thirteen Indigenous Grandmothers beleive that our ancestral ways of prayer, peacemaking, and healing are vitally needed today. They believe that the teaching of our ancestors will light our way through an uncertain future. If you like this program and want to hear more like it, consider supporting Curry Coast Community Radio. Here’s How. Flute music by Michael Penney.